The American Health Council recently elected Osama Elsawy, DO to its Board of Physicians for his outstanding contributions to the medical field. As a trauma and surgical critical care physician at Saint Joseph’s Regional Medical Center in Clifton, N.J., Dr. Elsawy provides high-quality care to his patients. Since entering the healthcare industry in 2012, he has expanded his skills in critical care, trauma, surgery, medicine, patient care and teaching. Possessing an interest in biology and the human body in its entirety, Dr. Elsawy decided to pursue a career in the medical field. He enrolled at Cairo University in Egypt and after graduating in 1997, he enrolled at the University of Northern Iowa that same year. After completing undergraduate courses and earning a bachelor’s degree in biology and chemistry in 1999, Dr. Elsawy began biology graduate courses at the same institution. From 2000 to 2002, he served as a research assistant at the university, and by 2002, he graduated from the University of Northern Iowa. He immediately began a rigorous academic coursework at the University of Medicine and Dentistry of New Jersey School of Osteopathic Medicine. After graduating from the institution in 2006, he accepted an internship at the same institution. By 2007, he began a four-year general surgery residency program at the Lutheran Medical Center. He simultaneously performed as an attending physician at the New York Community Hospital from 2011 to 2012 while completing a fellowship in surgical critical care at the Lutheran Medical Center. 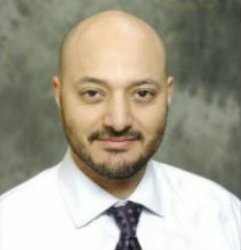 After successfully completing more than a decade of academic and professional medical training, Dr. Elsawy landed at St. Joseph’s Regional Medical Center and has since performed emergency surgeries. Board certified in critical care and general surgery, he consults with patients regarding various ailments, and he educates them and their families on their condition and treatment plans. Additionally, he serves as an educator as he teaches medical residents while serving as the associate director of the resident program at Rowan University School of Osteopathic Medicine (RUSOM). To continue to evolve alongside physicians and medical professionals, Dr. Elsawy is a member of several associations, including the American Osteopathic Association, the American College of Surgeons, the National Arab American Medical Association and the American College of Osteopathic Surgeons. He contributes to Doctors Without Borders, Sierra Club, Operation Smile, WNYC, St. Jude Children’s Research Hospital, Shriners Hospital and the United Nations High Commissioner for Refugees, an agency that helps homeless refugees seek shelter. In his free time, Dr. Elsawy enjoys staying active by hiking and working out, as well as spending time with his family. Proud of his academic and professional achievements, he attributes his success to his passion and work ethic. He enjoys teaching student residents and looks forward to continuing to work as the associate director of the resident program at RUSOM. St. Joseph’s Health is committed to provide exceptional quality care which sustains and improves both individual and community health, with a special concern for those who are poor, vulnerable and underserved. St. Joseph’s Health is accredited by Det Norske Veritas (DNV) Health Care Inc., the leading accreditor of U.S. hospitals. St. Joseph’s Health received formal ISO 9001:2008 certification by DNV. SJH is the third hospital in New Jersey and among 86 in the nation to receive this certification.